Although best known for their ability to scavenge free radicals and thus prevent tissue damage from reactive oxygen species, bioactive flavonoid accumulations in specific plant organs have been shown to influence plant growth, by either directly altering enzyme activities or by altering protein phosphorylation state. Higher plant proteins that have been shown to be regulated by flavonols include multiple drug resistance-like P-glycoproteins (MDR/PGPs/ABCBs), the dual function tyrosine aminopeptidase/trafficking protein APM1, the pollen-specific tyrosine phosphatase PTEN1, the RCN1 subunit of protein phosphatase 2A (PP2A), and kinases similar to the protein kinase C homolog PID. ABCBs, APM1, RCN1, and PID-like kinases have all been shown to function in transport of the plant hormone auxin. APM1 appears to have an additional role in plant fertility where PTEN also pays a critical role. Our current emphasis is on the role of PTEN family members (which have tissue-specific expression) in flavonoid modulation of membrane fluidity and lipid signaling.For studies of flavonoid regulation of plant signal transduction we use the model system Arabidopsis thaliana because of the powerful molecular genetic tools that have been developed in this system. 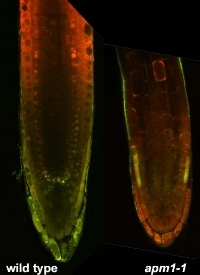 Arabidopsis is also attractive because of the availability of well characterized transparent testa (tt) mutants which harbor lesions in genes encoding enzymes in the flavonoid biosynthetic pathway. Use of the tt mutants has allowed me to identify developmental processes and signal transduction pathways that are regulated by single flavonoid species. We have shown that flavonols directly interact with MDR/PGPs and APM1. The mechanism by which APM1 is inhibited has not yet been determined, but flavonols appear to regulate PGP activity by inhibiting phosphorylation of key regulatory residues. Flavonoids also modulate PP2A phosphatase activity, and preliminary experiments conducted in collaboration with Dr. Alison DeLong at Brown University indicate that PP2A activity is greater in the absence of flavonoids and reduced in the presence of flavonols. Many flavonoid-deficient species are male-sterile, and both APM1 and the pollen-specific phosphatase PTEN1 are essential to pollen development, suggesting that these enzymes may be targets of flavonoid regulation in developing pollen. One of PTEN family members is expressed in the root elongation zone where flavonoid accumulation is strong, suggesting a role in the second phase of gravitropic signaling. Using molecular genetics and biochemical analysis of heterologously expressed proteins, we are attempting to identify the exact nature of flavonoid-target interactions. As an approach to elucidating the function of flavonoids in planta, we have begun an analysis of the evolution of flavonoid function and the variation of flavonoid function among phyla. Subclasses of flavonoids, e.g. flavanones, flavones, flavonols, are present among all plant phyla, i.e., bryophytes and allies, ferns and allies, gymnosperms, angiosperms, and some fungi; these are the products of the “early genes” in flavonoid biosynthesis. However, other flavonoid subclasses, e.g., flavan-3-ols, first appeared in the ferns and fern allies, and others, like anthocyanins, are only found in gymnosperms and angiosperms, products of the “late genes”. While the original functions of some flavonoids, e.g. protection from UV radiation, were retained, as new organs and new flavonoids arose, new functions did also, e.g. attraction of pollinators and rhizobia. As plant form changed and new or modified organs appeared (e.g., flowers), new flavonoids also appeared, most likely the result of gene duplication followed by mutational events, with a resultant gain-of-function. Flavonoids function in transcription, trafficking, cell signaling and cell-cell communication, signaling between organisms, etc. (see Peer and Murphy, 2005). When did each of these different functions first arise? Auxin transport is an example of a mechanism that evolved in the presence of flavonoids. In most bryophytes, auxin moves via diffusion, while in tracheophytes, auxin moves in a polar direction. Flavonoids affect auxin loading into the auxin transport stream at regions of auxin transport, and flavonoids also act as positive and negative regulators of auxin catabolism. When did flavonoid modulation of auxin transport evolve?